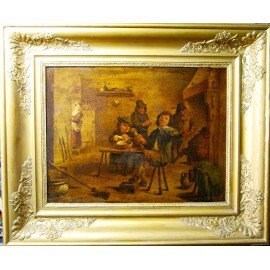 Flemish painting 18th century, interior scene, oil on panel, 19th century framing. DIMENSIONS: table 33 x 44 cm. Framed: 51 x 60.5 cm. Antiques flemish painting of the late 18th century, interior scene, oil on panel, 19th century framing, good state of conservation.